SANDY SPRINGS, Georgia — Republican Karen Handel has won the special congressional election in Georgia, fending off a strong challenge from Democrat Jon Ossoff in the heavily Republican House district, according to a projection by NBC News. Handel's victory in the closely fought contest, which drew national interest and was the most expensive House race ever at over $40 million, comes as good news for President Donald Trump. Democrats had promoted the contest as a referendum on the president. Rarely, if ever, has a single congressional race attracted this much attention or been freighted with so much meaning. Under the gaze of the national and international press, voters cast ballots they knew would be interpreted as a referendum on Trump, the GOP healthcare plan winding its way through Congress, and so much more. Congratulations to Karen Handel for winning the Georgia special election. I look forward to working with her in Congress. Congrats @karenhandel looking forward to working with you in Congress! With over $50 million in dollars in spending, the race shattered the record for the most expensive House race ever — by more than $20 million — set in a 2012 Florida race. Final spending numbers are likely to be even higher once the full data is released. The candidates and their surrogates professed the race was being misread by national pundits. "They have tried to make this a national election, but it is a local election," said Republican Jere Wood, the seersucker and bow tie clad mayor of Roswell, Handel's home town. But despite the adage about all politics being local, national issues clearly motivated voters here — just as they do everywhere at a moment of intense polarization and political engagement. Handel and tens of millions of dollars in ads from GOP super PACs called Ossoff an inexperienced liberal who has more in common with California than Georgia. Ossoff, meanwhile, promised supporters a chance to "make Trump furious" and "send a message that will be heard across the country and around the world." Trump has repeatedly weighed in on the race, using Twitter on Tuesday to warn voters that Ossoff "wants to raise your taxes to the highest level and is weak on crime and security." Earlier in the day, Handel appeared at her polling place to mock Ossoff for the fact that he doesn't even live in the district, and cannot vote for himself. Ossoff was raised here, but currently lives a few miles away so his fiance can be closer to the medical school she attends. Ossoff spent the day crisscrossing the district to visit polling places and give pep talks to volunteers. 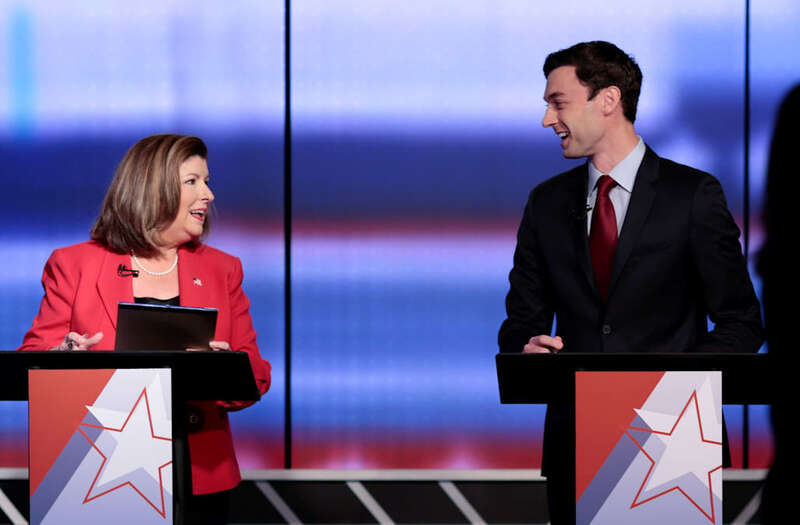 From day one, Ossoff had a very narrow target to hit while Handel had more room for error in this longtime GOP stronghold. He had to hunt for every Democratic vote in these wealthy suburbs once represented by Newt Gingrich, and needed to pick off some Republicans and Independents too boot. Handel, meanwhile, just needed to bring home a respectable number of people who spent years voting for Mitt Romney, John McCain, and the dozens of other GOP candidates before Trump came along. As skeptical as these generally well-educated Republicans have been about Trump, many were even more reticent to vote for a Democrat — even one who presents as moderately and even-tempered as Ossoff. Voters were excited by the chance to "make a difference," as Kelly Gibson said as held her baby daughter outside a polling place in Roswell Tuesday. "But I'm ready for it be over," she added. That may be the only sentiment sentiment supporters of both candidates can agree on here after an endless barrage of phone calls, door knocks and TV ads. Meanwhile, in South Carolina, a special congressional that did not attract nearly as much attention, finished closer than expected. Republican Ralph Norman defeated Democrat Archie Parnell by fewer than 5 percentage points with over 90 percent of the vote counted.